Here is a little charcoal kit that most art supply stores or art supply sites carry. All of the things in the kit can also be purchased separately. You don't need all of this -- you could just use some vine charcoal to make this big Charcoal Doodle drawing. 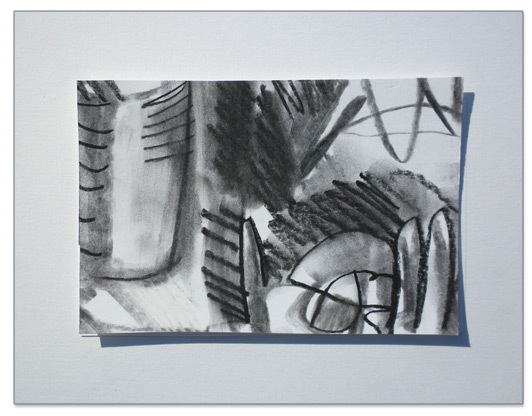 Or, you can experiment with "the works" -- all of these various forms of charcoal, chalk and tools. This includes: vine charcoal in lots of different sizes and hardness (I prefer it to be soft), charcoal pencils, compressed charcoal, white chalk or conte "crayon" or pastel, blending stumps (look like rolled gray paper) and a kneaded eraser. You could use ANY paper. I am using smooth bristol "board" paper. By experimenting with different papers and even colored paper you get to find out what you like and how each of them "work" for you. Big Paper -- Big Fun with Charcoal! Bigger paper makes it fun to work all over the paper and THEN find your favorite small composition or smaller format within your big, playful, fun charcoal drawing. Start with a piece of soft vine charcoal. Draw in a more realistic way if you want or cut loose with squiggles, doodles and fast, playfully placed free and continuous mark-making scribbles. This will give you a FEEL for charcoal. If you do have a variety of charcoal media, you can work with all of it and explore what each stick of charcoal or charcoal pencil does. Rub it with you fingers and work it with the "stump" as well. My compressed charcoal in the bigger package has some white paint on it from when I've worked with it while I was also painting with gesso (a white paint often used on top of raw canvas for preparing a painting surface.) The charcoal did not come like that! Feel free to add some water based paint (such as gesso) to your drawing if you like. Remember that you can keep layering on top of what you have been drawing and smearing. You can also erase some of it back or lighten it again with your kneaded eraser. Use the stump to get into tight areas. Use the stump to push, blend and extend your charcoal that is on the paper further into the paper and into adjacent areas on the paper. Explore and experiment! Yours will look like YOURS. Yours is not supposed to look like my drawing or like any other artist's drawing! Relax and have fun. Next we will find the pearl in the oyster! An Awesome Little Picture Birthed from the Big Picture! You will need a postcard and a ruler or right angle triangle and a matt knife, single edge razor blade or something similar to cut thru the bristol board paper. We are going to make a new smaller composition from your BIG picture! Here I am going to use a postcard to make the view finder (aka the "awesome composition finder".) Using the view finder, you will uncover the most powerful format for your smaller composition. The smaller composition will be birthed from the larger composition! You might even find several new compositions in your large drawing. But remember, you don't have to cut down your big picture at all if you just want to leave it as it is. If you do choose to find the smaller "story" in the bigger "story" -- feel free to use any size format that you want. 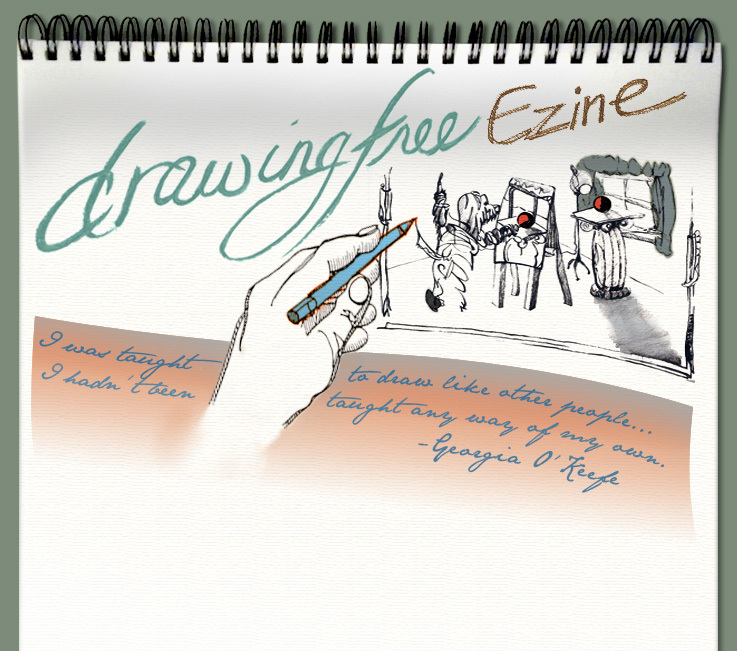 As an alternative you could use the Drawing Free Ezine 8 method of finding the best composition! Here we are using a postcard to make a compositional "view finder" that is the size of a postcard. If you do make a postcard or postcards, have fun sending your original or printed artworks out into the world! Your finished "postcard" ready to send or mount!